Like rear-mounted engines and torpid evolution, skepticism sits at the core of Like rear-mounted engines and torpid evolution, skepticism sits at the core of what makes a Porsche a Porsche. Since the very start, Porsche customers have challenged the decisions behind every new model, and the 1960 356B was no exception. The exterior changes to get from A to B were hardly radical — more upright headlights, raised bumpers, and a larger luggage-compartment handle — and yet they were enough to provoke both fickle distributors and fanatical customers. Porsche’s words were the truth. The bulk of the 356B’s revisions weren’t just invisible, they were also rather mundane. A two-page list of changes included items like valve guides, finned brake drums, transmission mounts, and shift forks — details that refined the driving experience but didn’t redefine it. The compact, nimble 356 already possessed all the right attributes, winning the positive reviews of critics, the dollars of enthusiasts, and the checkered flags of many races. Over its long production run, the 356 claimed class wins at the 24 Hours of Le Mans, the Mille Miglia, the 12 Hours of Sebring, and countless rallies. Predictably, it also became a staple in amateur circuits. The 1962 356B 1600S on these pages regularly lapped tracks in Southern California in the 1970s and ’80s under a coat of brown paint before being returned to street condition in a fresh factory color scheme. 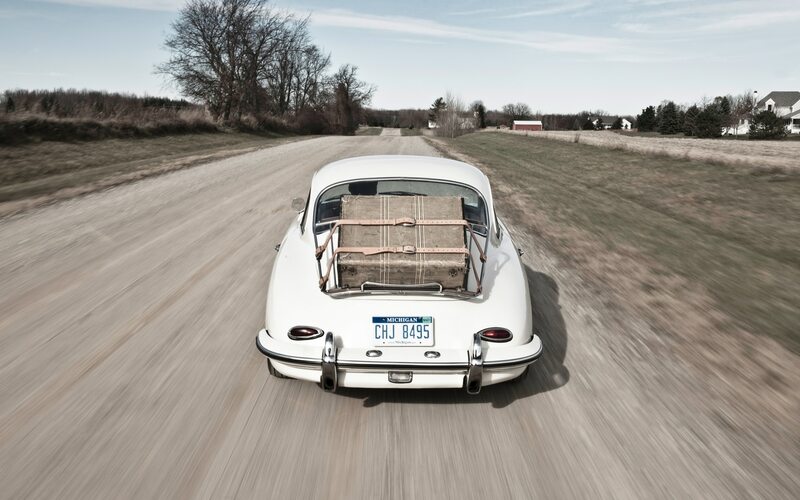 Today, vintage two-point Simpson racing belts are the only indication that this 356 was once a gutted race car. At a red light in suburban Detroit, a forty-something woman in a Honda CR-V pulls alongside our 356, honks her horn, and, with the kind of wide-eyed craziness you expect to see at Walmart the day after Thanksgiving, screams, “I want your car!” Then the light flips to green and her “compact” crossover effortlessly and unintentionally dusts the Porsche. Beautiful as it is, the streamlined grace of the 356 wasn’t a product of conscious aesthetic design. Porsche’s team was fanatical about aerodynamics, continually massaging the shape and validating theories by observing wool tufts taped to the body. Their diligence paid off with a top speed in excess of 100 mph. Modern wind-tunnel tests have recorded a drag coefficient as low as 0.296 for a 1950 356 coupe. 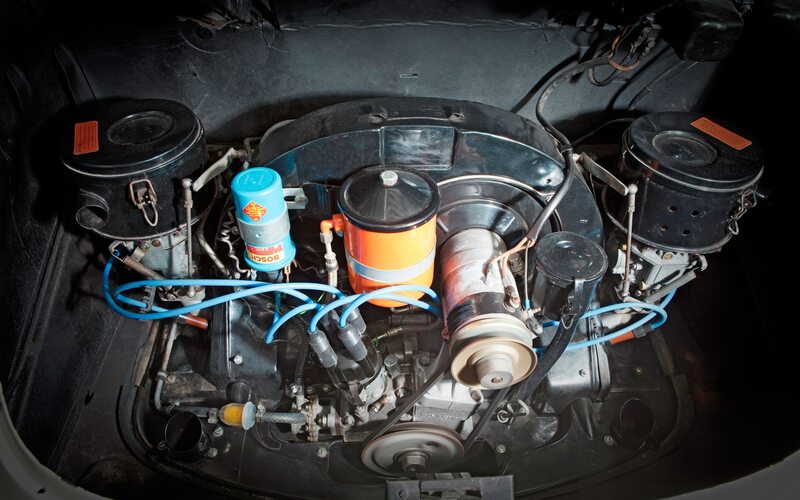 Mueller, whose photography frequently appears in the pages of Automobile Magazine, also owns another rear-engine two-door, a 1961 Volkswagen Beetle with Okrasa go-fast parts. “When I bought the Beetle,” he says, “I wanted a 356 but couldn’t afford it.” VW’s coupe is a consolation prize with its own appeal, but by 1960, the cars’ strongest ties were the men who designed them, not the parts they were assembled from. Although the 356 still borrowed almost 200 parts from the Bug — mostly fasteners — the most significant bits were the suspension arms. Under the rear deck lid, engine similarities were limited to parts such as valve springs, camshaft gears, the cooling fan, and the basic concept of a horizontally opposed four-cylinder. Multiple contemporary road tests made mention of a practical lower rpm limit of 2000 to 2500 rpm, so it’s no surprise to find acceleration and responsiveness completely underwhelming when the needle is pointing to the left on the VDO tachometer. Above 3000 rpm, though, the 1.6-liter engine takes on a completely different character, responding to the slightest changes in throttle position and accelerating much more vigorously. The steering, via a large-diameter, thin-rimmed wheel, is massively heavy and a touch slow, and the required effort and large arm movements that come with rounding a corner make precise steering inputs more difficult than expected. This Porsche goes exactly where you point the wheel, but pointing the wheel where you want takes time to master. 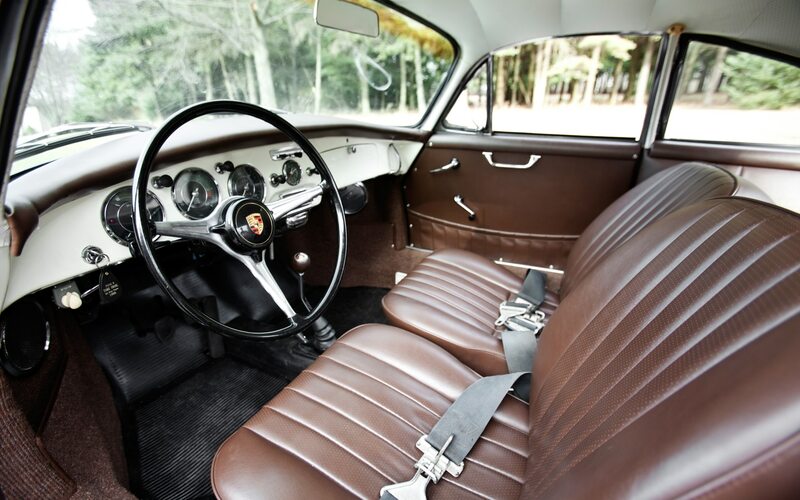 With the steering wheel less than eager to return to center, the 356 provides a workout both winding and unwinding lock. Similarly, the brake pedal requires assertive pressure with the four unassisted drums delivering an equally strong bite. 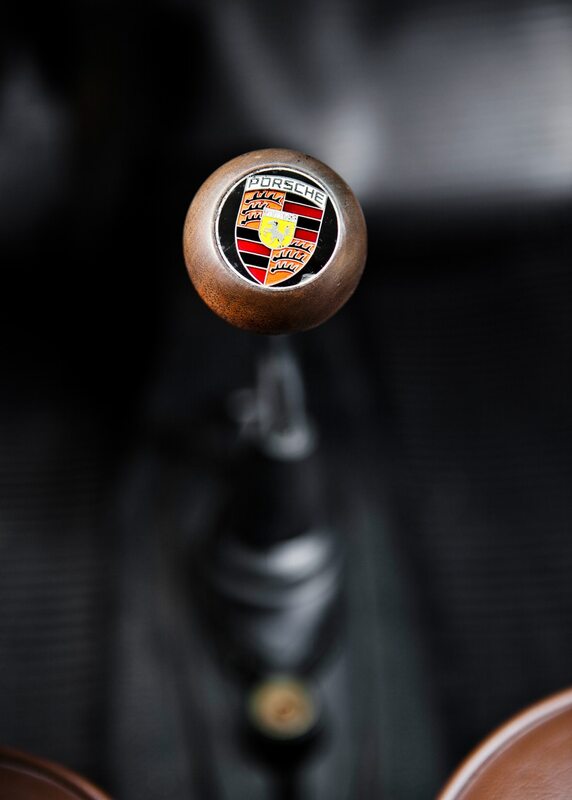 A wooden shift knob adorned with the Porsche crest is connected to long, effortless throws, with each of the four forward gears easily found thanks to their generous spacing. Perhaps too generous in the case of reverse, which is so far to the left that the gearshift pins my leg against the rim of the steering wheel. The only way to prod the throttle is to rotate my ankle so that my toes can poke around the brake pedal. Even at fifty years old, this car is not delicate. Whereas less enthusiastic classics goad you into the highest gear and carefree cruising, driving a 356 doesn’t feel right until you’ve kicked the clutch in, blipped the right pedal, and carried the car through a turn at full throttle. Mueller repeatedly encourages such behavior from the passenger seat, but I’m not convinced that exploring the handling limits in someone else’s rear-engine classic is wise. Instead, we take corners quickly enough to smile and marvel at the supple ride and controlled body motions. In long, sweeping bends with the engine singing at the upper end of the tach, the 356 reveals what is arguably Porsche’s most important enduring tradition. Just months after the B gave way to the C, the 356’s successor would bow. The all-new 911 came complete with a rear-mounted engine and a skeptical initial reception. It also delivered on the 356’s calling card: well-rounded driving dynamics — performance in every category — that still define Porsche sports cars to this day. It’s the car that started it all. 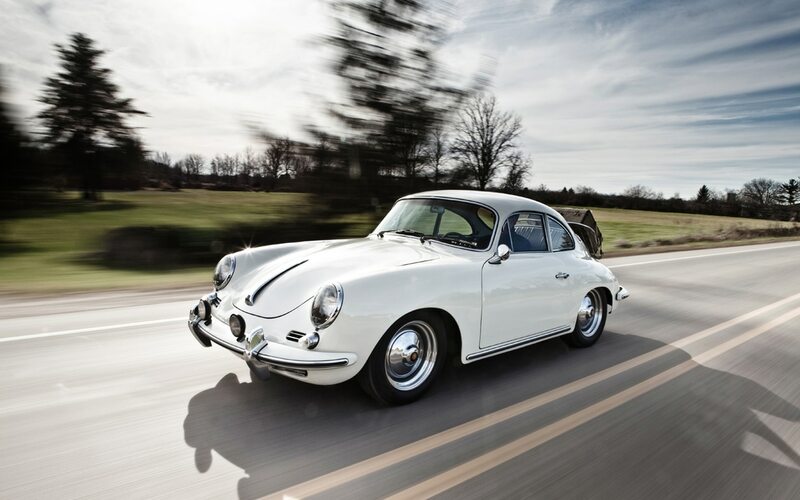 With a rear-mounted engine and timeless lines, the 356 has the hallmarks of a 911 with even more historical significance. 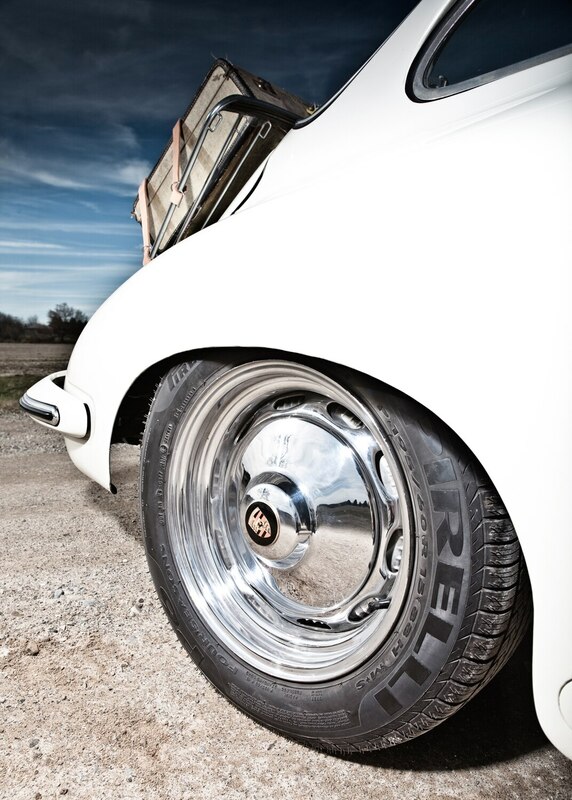 The B, produced in the second half of the 356’s sixteen-year production run, is by far the most common model, and multiple body styles and performance levels provide lots of choices (and price points). The humble-yet-hardy engine wants to be revved, and the poised chassis wants to be exercised. 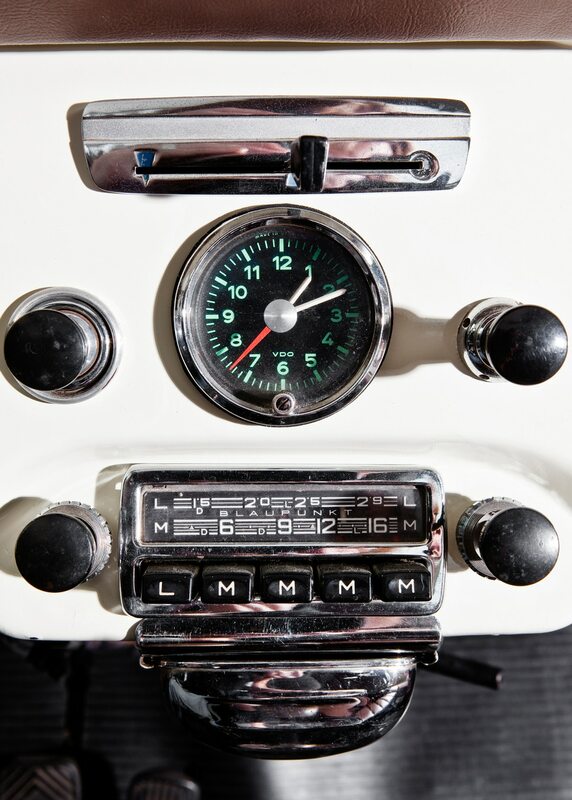 Drive it hard and revel in the simplicity of another era’s idea of a sports car.